NYC, 04/19/2019, 1:30PM. Fencing Workshop. 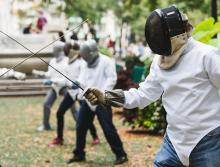 Learn the basics with masters from Manhattan Fencing Center. Must be 16 or older to participate.